So, a bit of mission creep. I originally wanted to just discuss Godzilla and a few of his imitations, but I realized that I was also interested in where the idead behind Godzilla came from. Giant radioactive lizards do not spring from nowhere. Ideas, especially film ideas, have a traceable ancestry, as well as a list of descendents, and I want to delve into the origins of ideas and the way they combine to create something extraordnary. As a result, I'll be in black and white for a little whle. I hope you don't mind. I would be remiss if I did not include what is considered the first appearance of a giant monster in film, George Melie's À la conquête du pôle (The Conquest of the Pole). In it, a frost giant attacks the party, consuming (and then regurgiating) one of its members. The anmation of the large puppet is pretty good; the eyes, brows, and ears wiggle, the mouth moves. The professors react in the same way as all humans confronted with gigantic monsters; they fire at it, to no effect. Only when a canon is brought to bear does the giant leave off snacking. It is not killed, however, but withdraws from the noise and smoke of the canon. 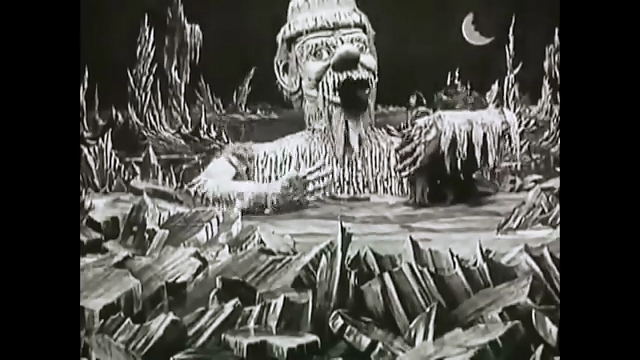 But The Frost Giant really didn't have much influence on Godzilla, or many other giant monsters. 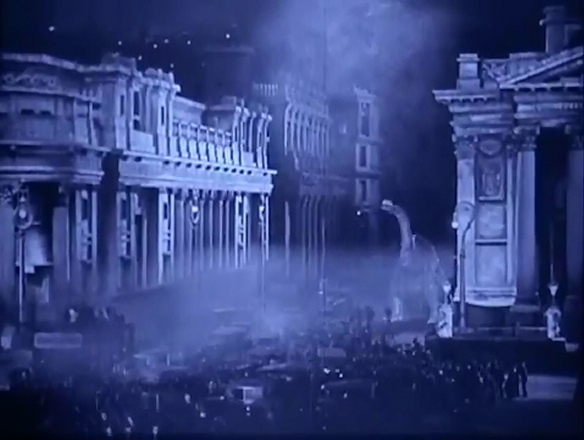 The construction technique is very different, it is not central to the film, and it has very little personality. The monster is in it's own territory, rather than trespassing on the the realm of mankind. 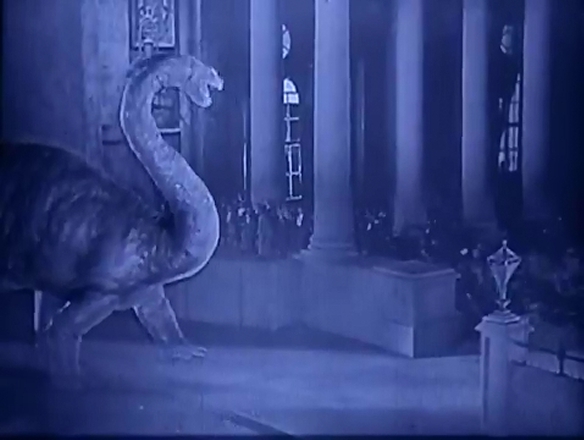 The oldest film that had the most lasting effect on Godzilla, and giant monster film in general, is the 1925 The Lost World, with dinosaurs animated by Willis O'Brien. This is, rather famously, a film greatly loved by Rays Harryhausen and Bradbury. Dinosaurs and humans share the screen effortlessly, thanks to O'Brien's pioneering use of split screen. 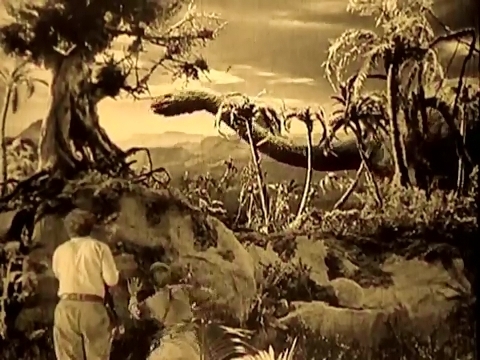 The Lost World was the first very successful dinosaur film, and the first international success of Willis O'Brien. As I discuss Godzilla's ancestry, Willis O'Brien and Eugène Lourié will consistently crop up. O'Brien's work in The Lost World is meticulous and fascinating. 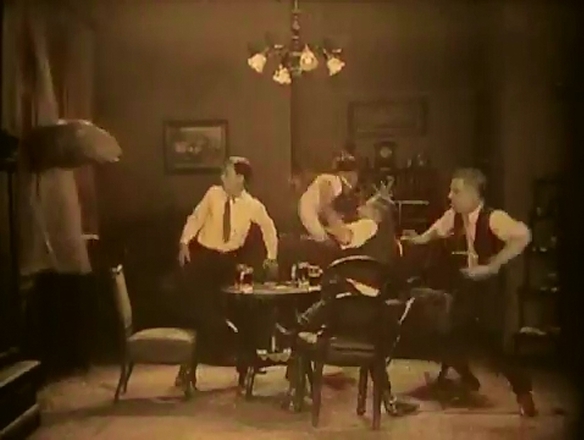 For this film, he incorporated bladders into several the models, allowing them to simulate breathing. His attention to detail and desire to make each model have its own personality serves him well here, but much more so in King Kong, since the big ape has a lot more screen time. The amount of time the film devotes to dinosaurs is impressive. They first appear 36 minutes into the film, and the model sequences are pretty consistent from then on. It's one of the most extensively special-effects films filmed up to that point. After an hour's worth of adventures on the Plateau of Dinosaurs, Professor Challenger manages to apprehand a sauropod and bring it back to London. 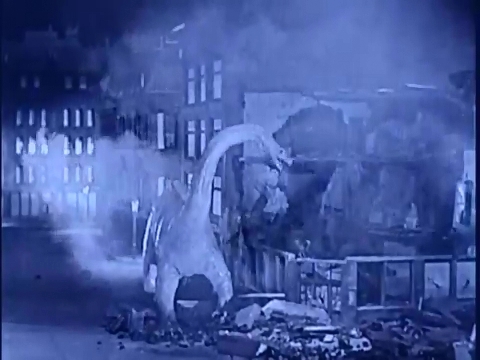 In the book, his capture was a pterodactyl, but the brontosaur was a much better idea for on-the streets mayhem. In the Crichton/Speilberg film, it is escalated again to a T-Rex. 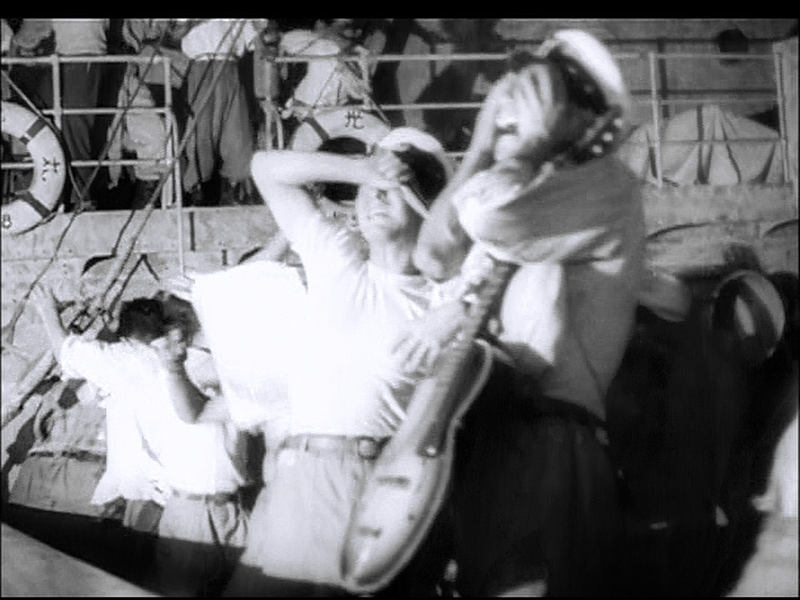 Kong-style (but off-screen) it gets loose and rampages for five muinutes at the climax of the film. People panic, fences are stomped, a building smashed, all before it crashes through Tower Bridge and into the Thames. Back in its element, it swims off, one of the few giant monsters to survive its inital clash with mankind. This is an enormously influential sequence, and will be referred to by Willis and his protegee Harryhausen several times. 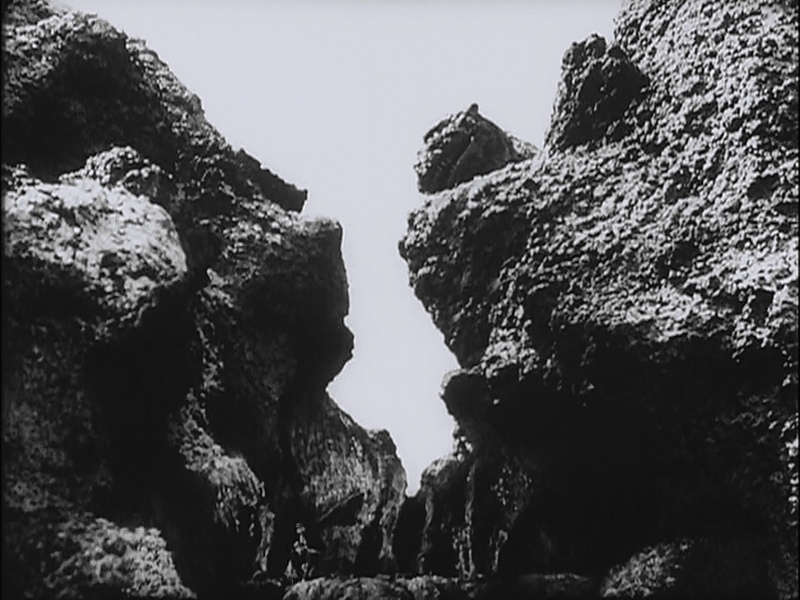 Images and scenes that are repeated or imitated include mother and child in the path of the onrushing giant monster (later seen in King Kong). The dinosaur is intrigued by the street lamp, as the Rhedosaur is intrigued with the lighthouse and fog horn in Beast from 20,000 Fathoms. 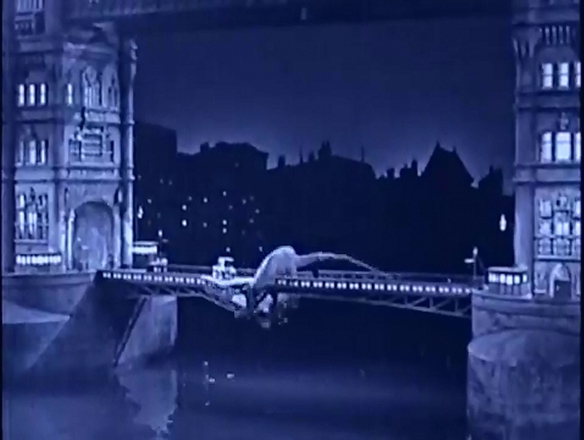 Tower Bridge is prominently featured, then damaged, as it would be in Gorgo. The brontosaur sticks its head in a window, the way Kong puts his hand into a window. 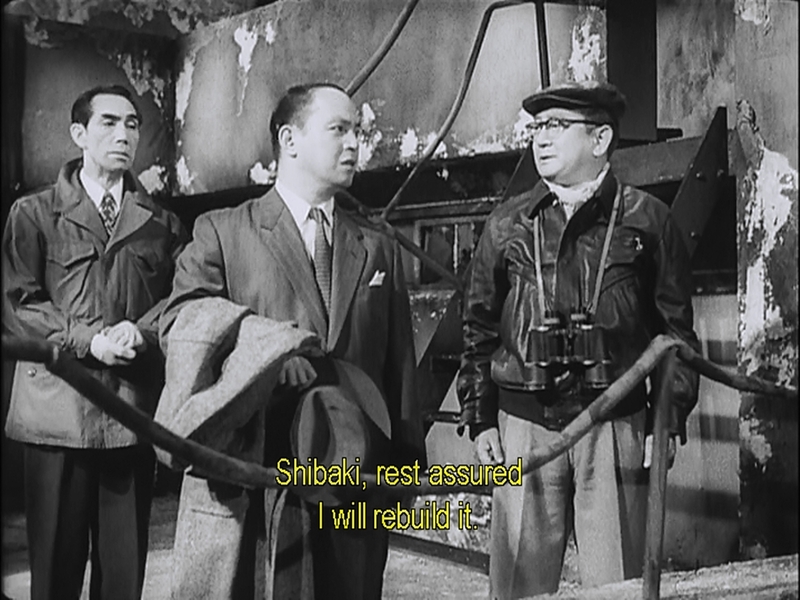 Fleeing men and women turn to the underground for safety, as they do in Godzilla, Godzilla Raids Again and Gorgo, while monster's heavy tread causes debris to rain down. In this five-minute sequence, the seeds are laid for the first generation of giant monster films. The beast runs amock, people flee in panic, and destruction ensues. Godzilla Raids Again changes the dynamic of the genre, adding the opponent for the monster to fight, but so many of the films I'll be discussing, from Beast from 20,000 Fathoms to Cloverfield take their inspiration, directly or indirectly, from this sequence. Next week, the Big Ape. With a quick side digression about a plumber. What does a film company do when they have an unexpectedly huge hit? They follow up with a quick, cheap, sequel. King Kong was followed up in nine months with Son of Kong, and Godzilla was followed six months later by Godzilla Raids Again. I won't be discussing the American versions of Japanese monster films if I can get the Japanese cut. I'm just not that interested. I'm a subs guy, as I find the process of dubbing can be convoluted, especially when attempting to cram English words into mouths speaking Japanese. This distances the dialog from the original concept, and unless there's some sort of genius doing the translating, it's three removes from the original, rather than one. I prefer to read the dialog, and listen to the voices of the original actors. As a result, I'm enjoying Sony's releases of these films on DVD, since they include a subbed Japanese version, as well as the dubbed and often recut American version. 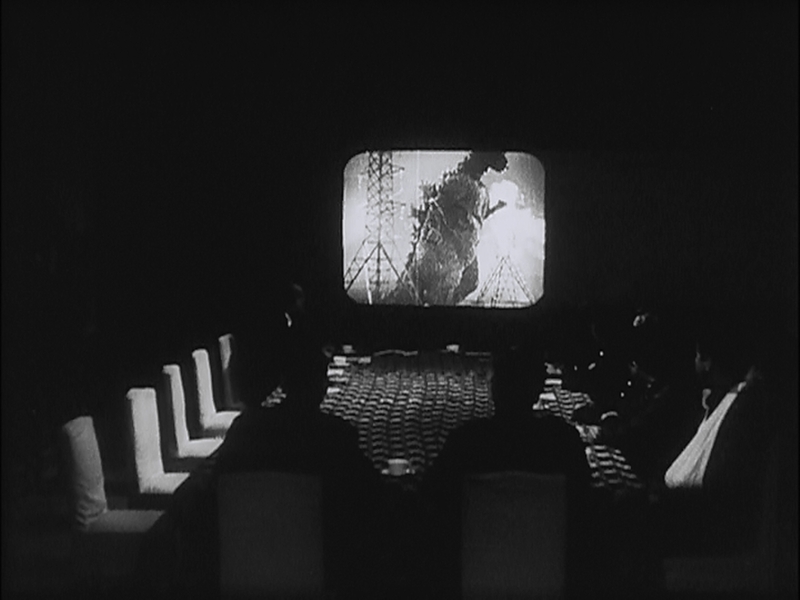 Godzilla Raids Again provides us with the answer to the impotent military posited in the original Godzilla. If the colossus cannot be defeated by conventional weapons, then how do we provide narrative tension? The answer is to fight fire with fire, and introduce another giant monster. And this is the moment the Godzilla franchise comes into its own, providing a stage for two or more gigantic monsters to meet and fight. 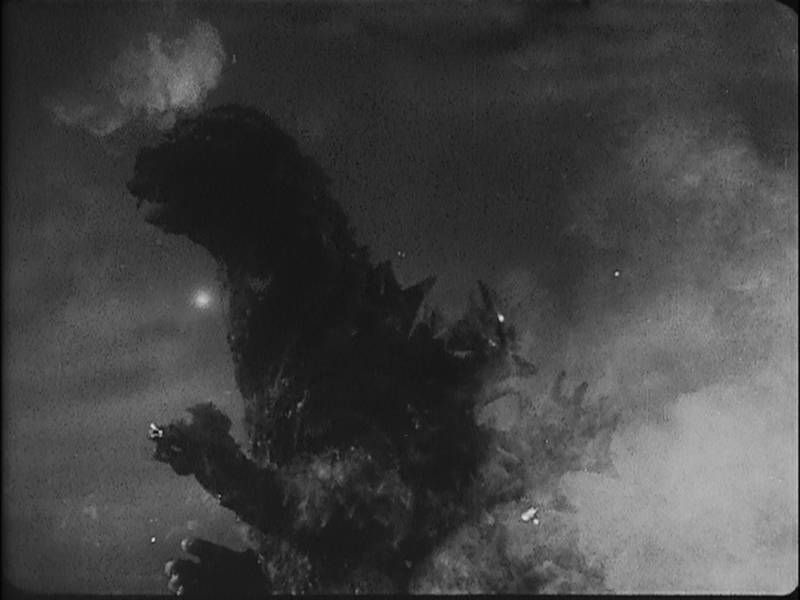 Godzilla is no longer a mystery, so he appears much earlier in the film that the previous one. Less than nine minutes in, Godzilla and Anguirus are shown, already locked in combat. This is a second mutated dinosaur. The original Godzilla was killed by the Oxygen Destroyer, and nuclear testing has once again produced a gigantic version of a dinosaur from the same family. But that's not important. What's important is that Japan must now face another attack by Godzilla. 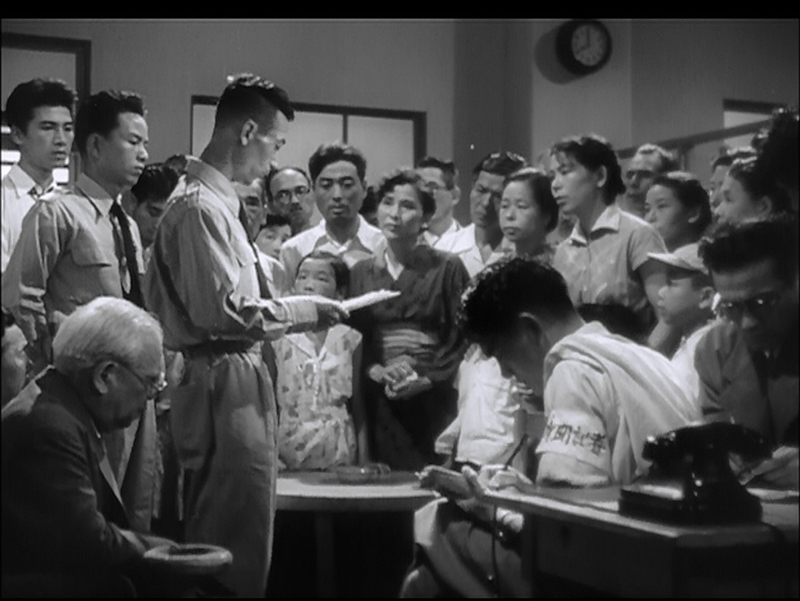 To remind the viewer of the original Godzilla film (remember this is the fifties, so there are no DVDs or home versions of film avalable), Dr Yamane (played again by Takashi Shimura, one of Kurosawa's pernnial players) shows us a quick reel from the previous film. It's a hoary old device, but one that works. Yamane and the military explicitly agree that the military is useless against these titanic monsters, and that they must keep an eye on the monsters in order to predict where they will be most destructive, and evacuate the civilians. The device used in this film is that Godzilla is attracted to light. This is a small reference to the first film, when Godzilla attacked the broadcast tower, having seen the flashing lights from the photographers. This may also be a reference to King Kong, as it's the photographer's flashes that set Kong on his rampage. 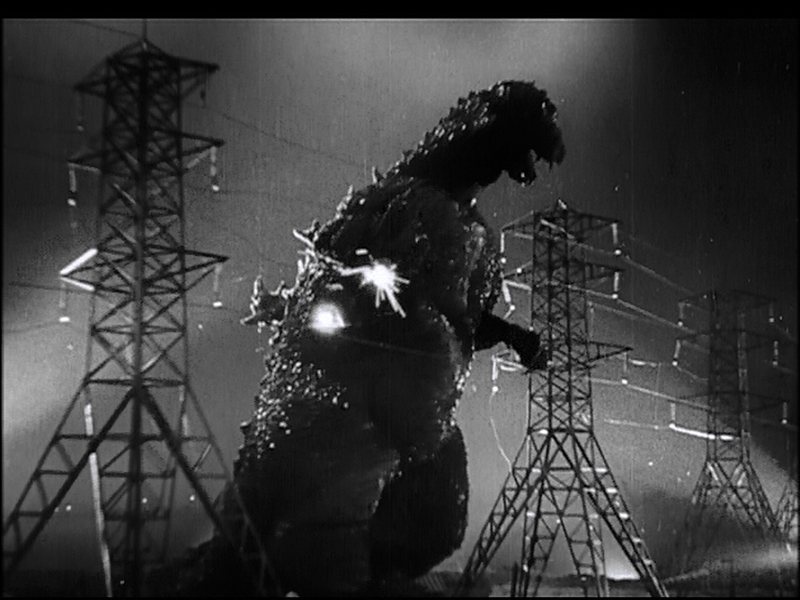 It also reinforces the Godzilla as American military metaphor, since the authorities shut down the lights of Osaka. The audience would have remembered blackouts during WWII bombing raids. It also serves to show the folly of men. 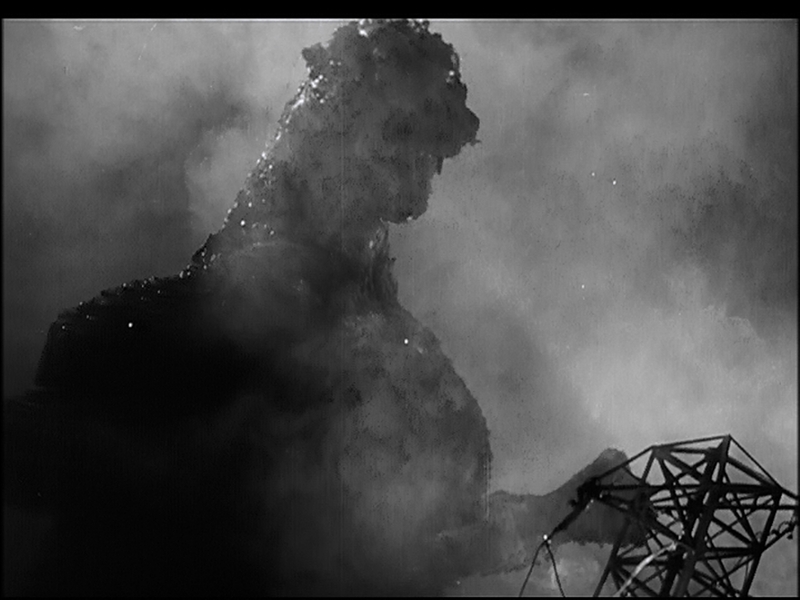 Godzilla is indeed distracted by the flares, but a fire at an oil refinery catches his attention, at which point Osaka gets stomped. The human characters are much more ordinary. Our protagonists are pilots for a fishing company, as well as the girls they are sweet on. Dr. Yamane appears only to give us plot exposition as the Gozilla expert. The smaller lives of these less-developed characters stand in contrast to the previous film. These are working-class, in the employ of Kaiyo Fishing Company trying to do what they can, not researchers or scientists. Godzilla's breath weapon is used, but in many ways it is downplayed. Anguirus takes a face full of it, but shrugs it off, either because he is already mutated, or it's not that powerful. But we do see the city going up in flames behind him. 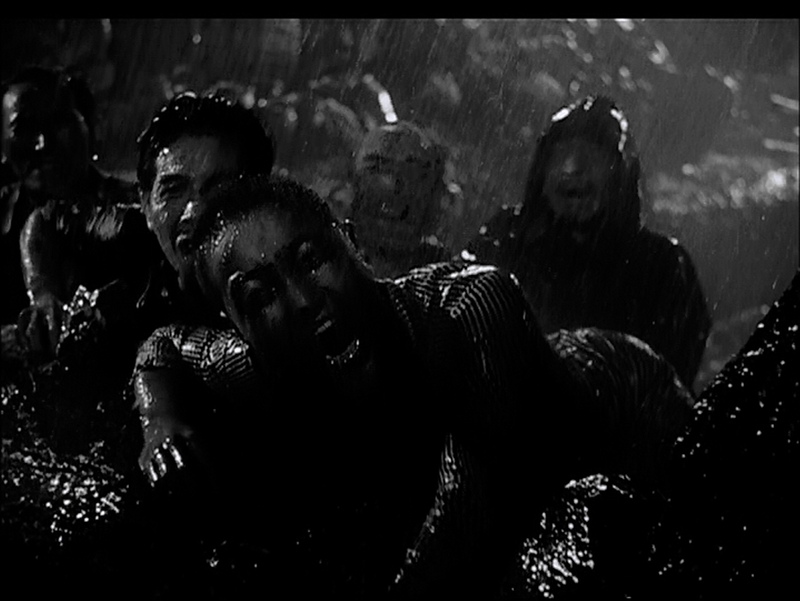 The wrestling is famously different from the slightly overcranked Godzilla scenes from the original film. These are slightly undercranked, so the wrestling is a bit fast. The effect isn't all that impressive, lending neither weight nor a sense of mass to the struggle. Which is strange, because some of the scenes of collapsing buildings, and a few of the monsters themselves, are clearly overcranked. This (along with the quick glimpse of a crew member while Tsukioka and Kobayashi are on the island) speaks to the cheap and rushed nature of the film. Anguirus is killed and then incinerated by Godzilla just over halfway through the film. As this was establishing the giant monster vs giant monster genre, this is unexpected. Later, the confrontation between the two monsters will be the set piece climax at the end of the film. Here, Anguirus is more or less there to give Godzilla something to do, rather than just crushing Osaka for the first half of the film. 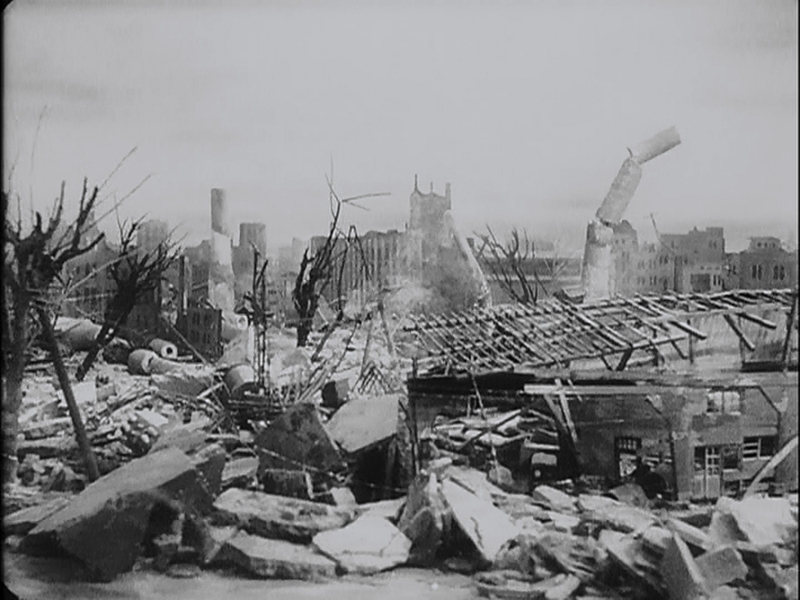 Although Godzilla Raids Again is still grim in tone, the scenes of destruction are not interspersed with scenes of human suffering. There are no crying children, and no scintillation counters. 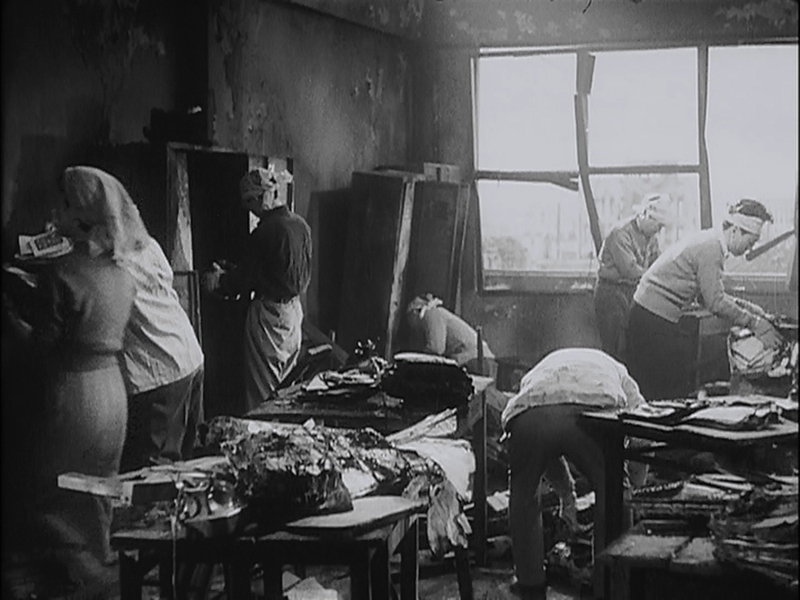 Immediately after the attack, the protagonists are seen cleaning up the burned remains of Kaiyo Fishing, and the president promises that he will rebuild it. This is a spirit of post-war Japan. Their country had been bombed pretty heavily, and there was a lot of work to be done. Godzilla vanishes the minute Anguirus is defeated. And then we are treated to a sort of slice-of-life comedy. It's a bit strange, although if the intent was to have the characters return to a 'normal' life after Godzilla's rampage, I suppose I understand it. It doesn't contribute to the disaster feel of he film, however. David Kalat equates the death of Kobiyashi, the popular and genial pilot looking for love, with a kamakazi suicide action. I think that's unclear in the Japanese version of the film. I find it equally possible that Kobiyashi was attempting to distract Godzilla. 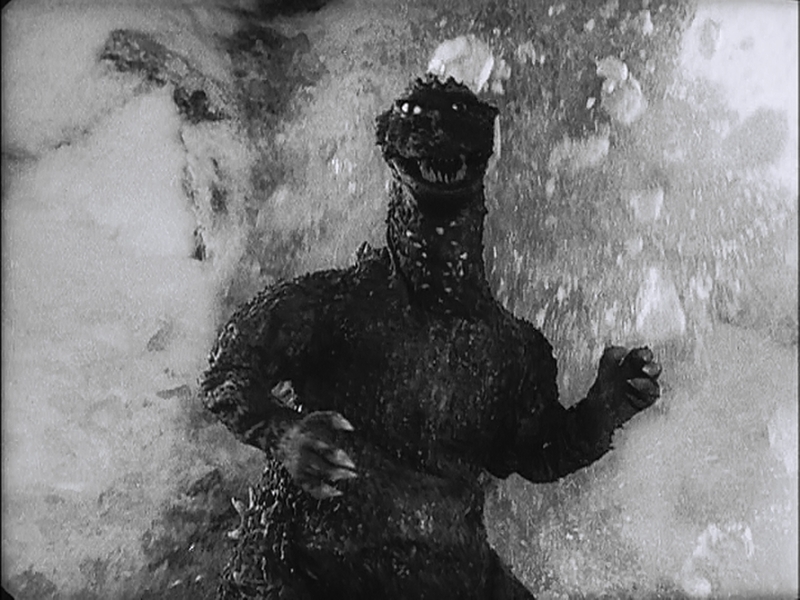 Yes, he is angry with the big lizard, but he is hit by Godzilla's atomic ray and crashes into a mountain. He was clearly conscious as he did so. If he wanted to crash into Godzilla, he could likely have done so, on fire or not. For the first tme in the franchise, the military is not entirely useless. Tanks and missiles are ineffective, and when the search is on to find Godzilla, the military deploys jets. It takes Tsukioka in his prop plane to locates him. However, once Godzilla is located, bombs and missiles work indirectly, causing avalanches of ice to fall on Godzilla, trapping the giantic beast at the cost of several planes and their pilots. Godzilla Raids Again is an unexciting, but not awful entry in the genre. It requires a bit of patience to appreciate and love; it's not a great, layered work of art. I find it interesting as a look into the way that the genre evolved. In the end, Godzilla is buried under induced avalanches of ice on a remote island. And there he would remain until he wakes again. But was it the footsteps of a giant ape that awaken him to color after a seven-year sleep? Or was it something else? I suspect Godzilla has more than a hundred reviews around the net, not including Amazon.com. Certainly it's the best known kaiju film, having demonstrated the genre could generate a lot of money. 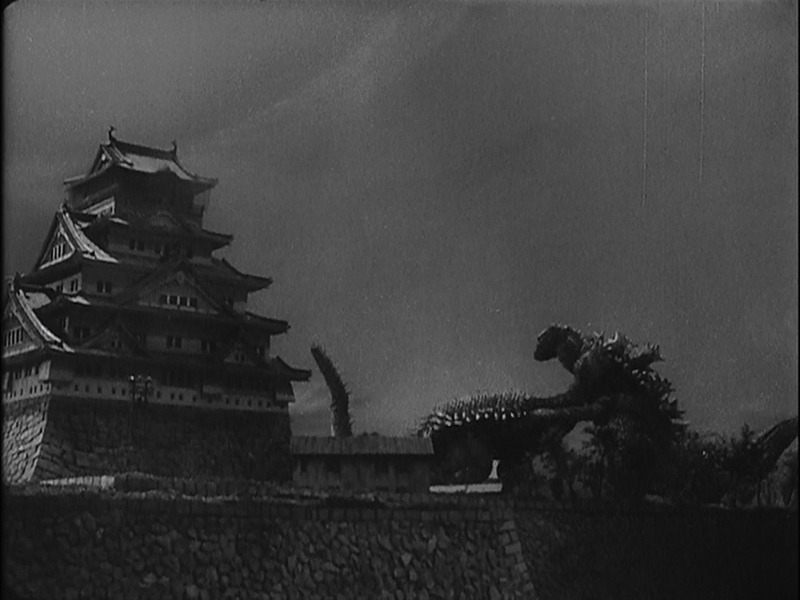 And though it is credited with starting the kaiju genre, the genre's roots go further back than 1954. King Kong (1933) is one of the first giant monster films. Kong doesn't destroy New York, but he presents us with that frission of the monster in a city. The work of Ray Harryhausen is another influence. The Beast from 20,000 Fathoms and Giant Behemoth gave a great deal of inspiration to Godzilla, making the Big Lizard not so much the originator of the genre, but it's mega-break-out star. Godzilla did, however, establish the Japanese suitimation monster movie, and the dozens of films (Godzilla himself stars in some twenty-nine) that follow the formula of giant monsters emerge and devastate a city. 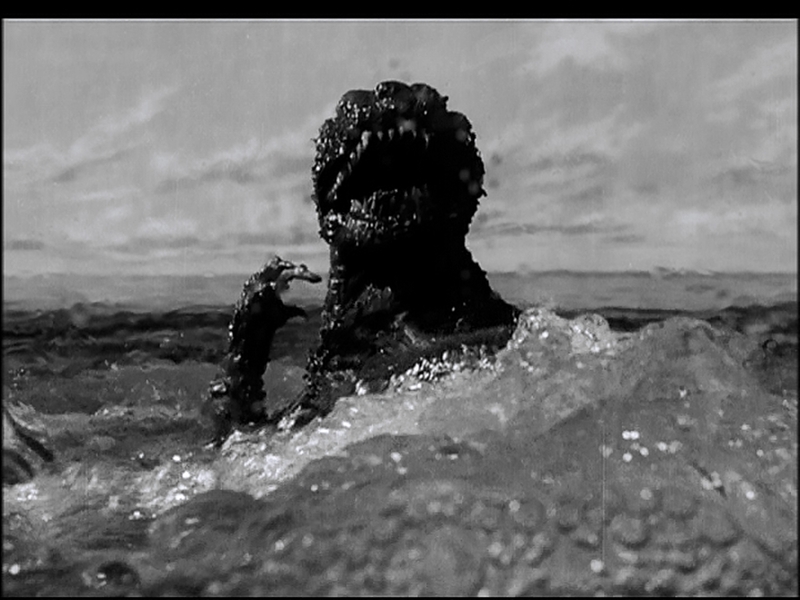 Giant monsters work best, for me, in film. Film has an immediacy, and an ability to leave questions unaswered where books can be blunt. The way that a giant minster moves is so important to its character, especially as the creature has no words, and thus is very difficult to portray in a static medium, such as in a comic or a book. Only Japan could have birthed Godzilla. While it is well-known that Godzilla is the the son of nuclear testing and attack (it was released in the wake of not only the atomic bombing of Japan, but also the fallout poisoning of Lucky Dragon 5, which happened early in 1954, the year Godzilla was being made. The immediacy of that connection is often lost on modern audiences. But Godzilla can also be seen as the son of tsunami, typhoon, and earthquake, all natural disasters with which Japan is intimately familiar. Godzilla comes from the sea like a tsunami, or typhoon. Until 1984's Return of Godzilla, this is the only film in which Godzilla does not fight another giant monster. Here, Godzilla is faced with only the military, which is completely ineffectual. 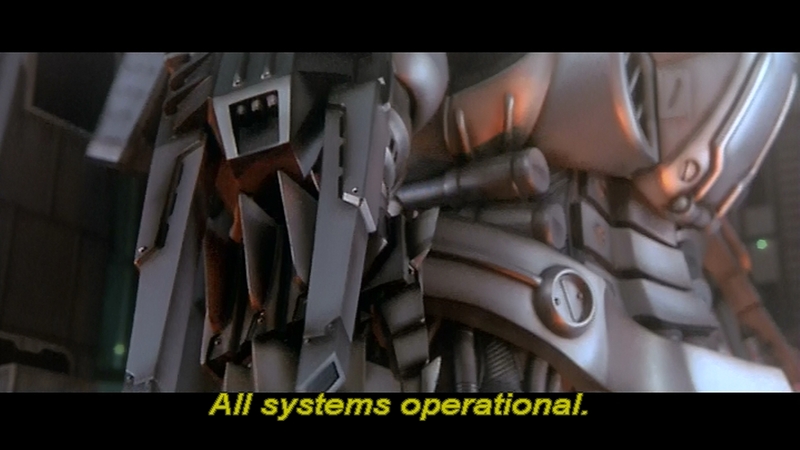 This is a recurring theme in the franchise, the inability of the military to stop the creature. Science destroys Godzilla, not force. This pacifistic paradox stands in many of the earlier Godzilla films. While the military is called in, they merely mark the gigantic creature's invulnerability and frightening powers, such as radioactive breath. In subsequent films, there is a feeling of pro forma military action. Everyone knows tanks and missiles are useless, but something has to be done. In this first film there is some hope that tanks and artillery will work, but it is extinguished when Godzilla responds with a more terrible weapon, his radioactive heat ray. 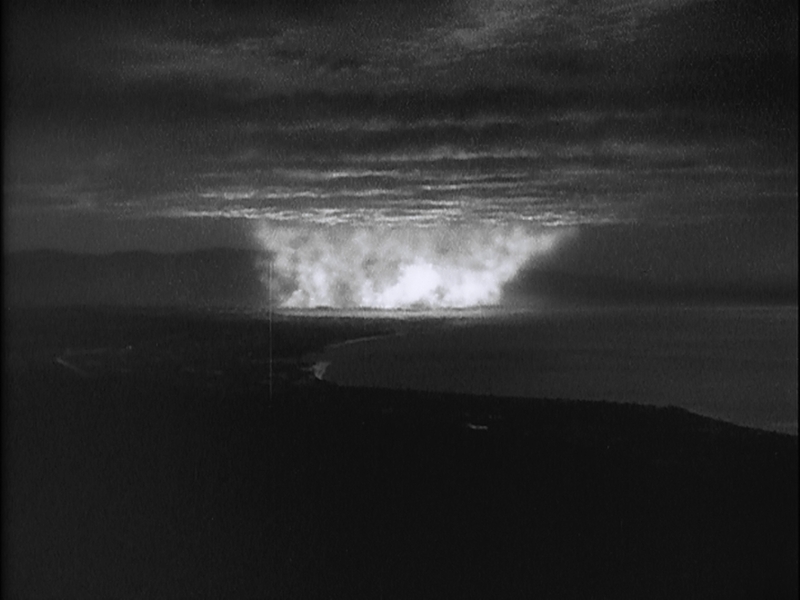 So in addition to everything else, Godzilla can also be seen as a version of American aggression, which responded with nuclear hostility when attacked. Unlike subsequent films in the series, Godzilla draws its emotional power by focusing on the suffering caused by Godzilla. 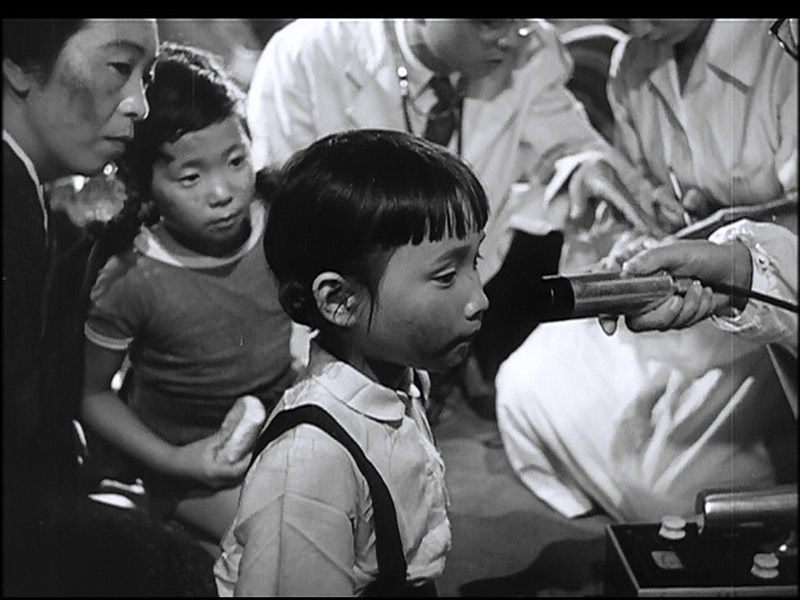 Scenes include the relatives of the Emiko-Maru's crew waiting to find out their fate, Shinkichi screaming for his brother to run as his house collapses, children being checked with a scintillation counter, (cut from Godzilla, King of the Monsters), and a mother holding her children in abject terror as the city collapses around them (also cut from the Amnerican release). This aspect, which includes showing us Godzilla 23 minutes into the film, tells us that the monster is not frightening for what it is, but rather what it can do. In later films, we see the stock image of people running from the giant monster, but we seldom see them in pain or weeping as the titan destroys their lives. In addition, the various protagonists, all sympathetic, are at odds as to what to do about the gigantic menace. Dr. Serizawa has the power to destroy it, but doesn't want to expose the world to his terrible creation. Dr. Yamane wants to study the creature, given its uniqueness. Emiko, Yamane's daughter, promised to Serizawa and in love with Hideto Ogata, it torn between duty and love. Only when she sees the distress around her does she break her promise and sacrifice her personal honor in order to try to destroy Godzilla. Ogata himself, working class and handsome, is the only person convinced (until Emiko walks the corridors of the hospital choked with the wounded and dying in the wake of Godzilla's attack) that Godzilla must be destroyed. Initially Godzilla is attacked with machine guns. It is only during his second trip to Tokyo that he is attacked with tanks, artillery, and a large electrical fence. During this attack, Godzilla first unleashes its terrible nuclear breath, which melts steel, destroys tanks, and turns Tokyo on a sea of fire. 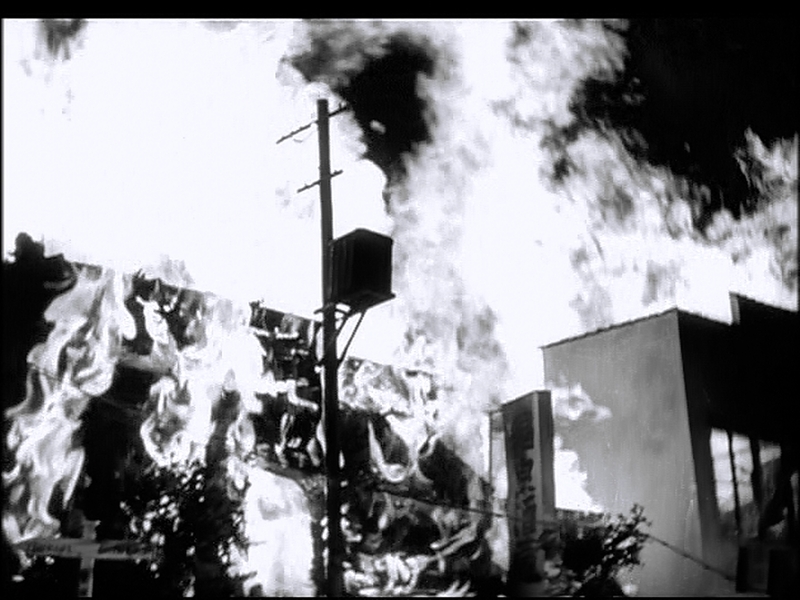 This may be a call back to the horrific firebombing of Tokyo in 1945, and possibly the 1923 Kanto earthquake, which devastated Tokyo and Yokohama. Following the earthquake, enormous fires broke out, consuming more than half a million homes. As a soundtrack afficionato, I feel that the contribution of composer Akira Ifukube is often overlooked. Some of his atmospherics uninspiring, but the Godzilla theme remains a classic. The heart of the film is in the beautiful "Prayer for Peace" which, accompanied by the scenes of devastation and long panned shots of bloodied hospital patients, punches the audience in the gut. "May we live without destruction/May we look on tomorrow with hope," sings the choir, guiding the audience to the same conclusion Dr. Serizawa does--that peace and hope are worth sacrifice. Godzilla's death is not a triumph. It is a sad moment, both for Serizawa and for Godzilla. As Godzilla surfaces for one agonized scream, we feel little triumph, despite the reporter calling it such. Instead, we feel relief that the disaster has ended. This identification with the tragedy of the monster is another emotional thread that sets this flm apart from most other monster films. Godzilla is not a villain. He simply is too large, too destructive, to co-exist with humans. 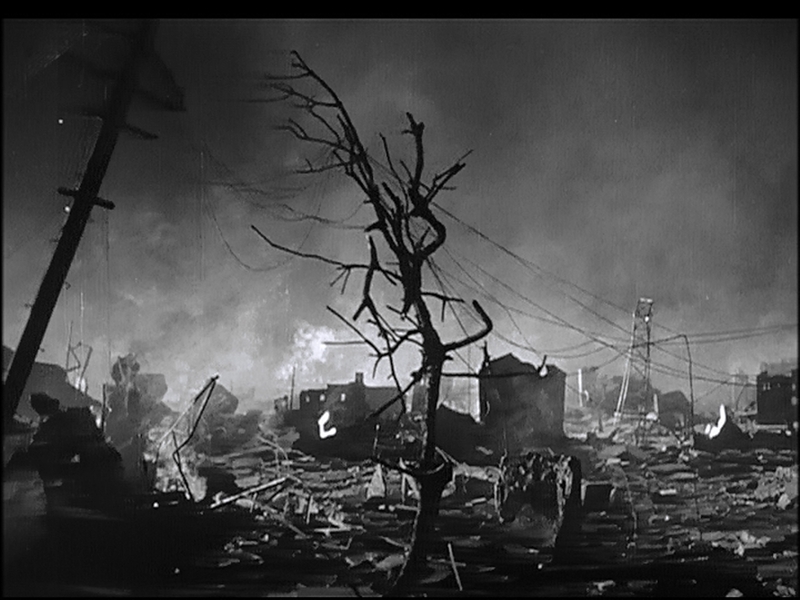 The film ends with an on-the-nose plea for nuclear testing to cease, lest it bring up another Godzilla-like disaster. Ultimately, the world did not grant this wish. 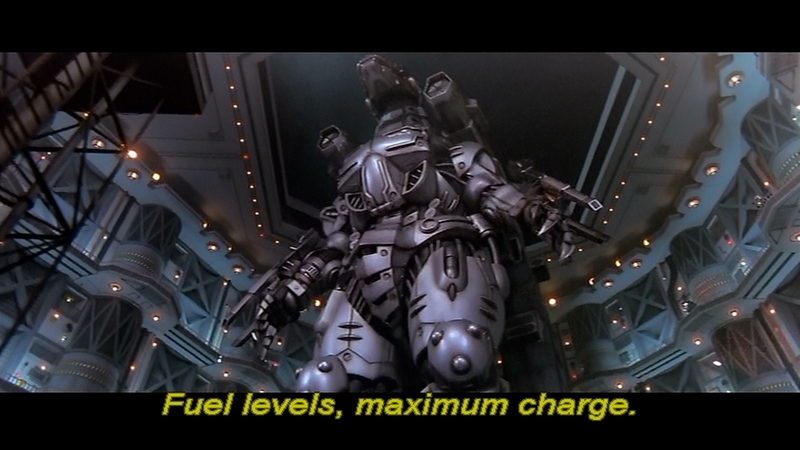 Godzilla is a great film, and practically unique. Few other films take a gigantic monster so seriously. The human action is pretty good, pitting the characters against themselves as the Giant Disaster Lizard pushes everyone. This may not be where the kaiju got started, but for me, it's where they got interesting. 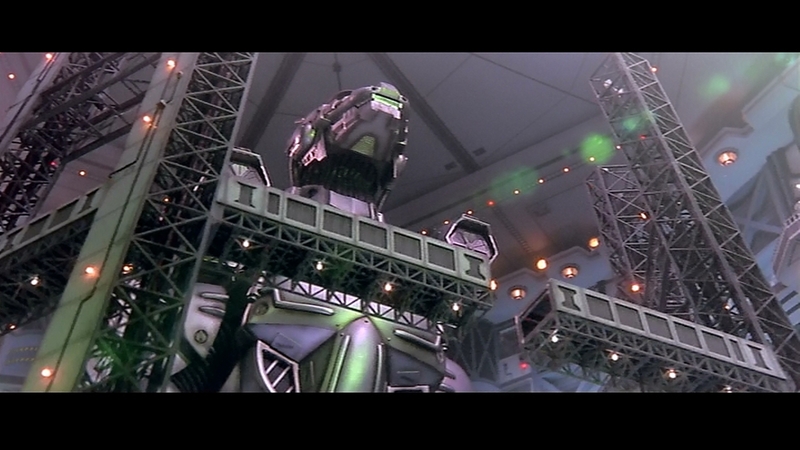 As long as I've liked gigantic things destroying buildings, I've preferred the monsters over the robots. The giant robot genre has never interested me, and I think I finally know why. A huge monster is what it is. A giant radioactive lizard, a gargantuan moth, a massive alien from another planet, it doesn't require an explanation. It just is, and it's coming to tear down the city, and it has to be stopped. The giant robot, on the other hand, is made by human ingenuity, and the director always feels the need to show off how awesome that creation is. What we inevitably get is the overlong deployment. 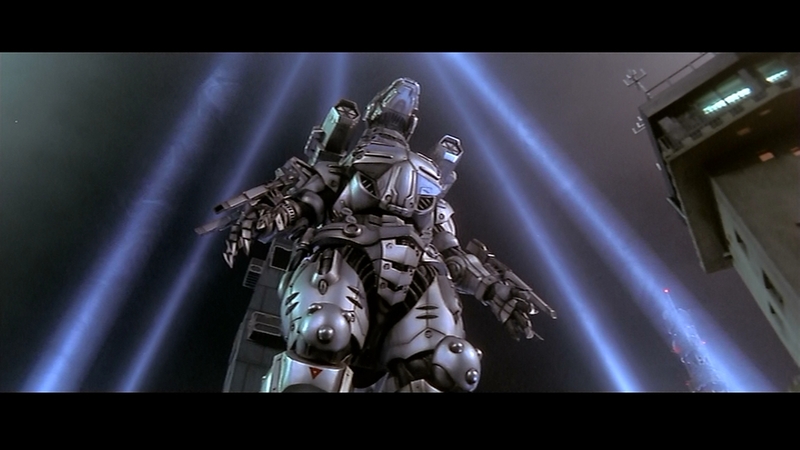 Here's Mechagodzilla ("Kiryu") from the 2003 Godzilla: Tokyo SOS. 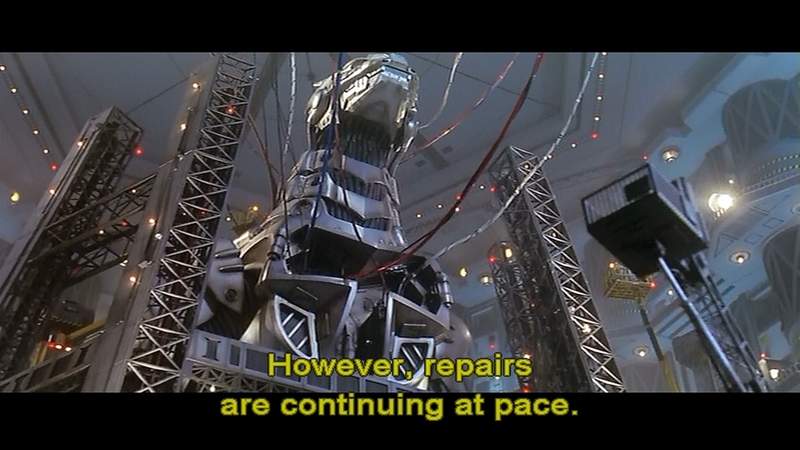 It's being repaired from it's last encounter with Godzilla (Godzilla vs Mechagodzilla, 2002). 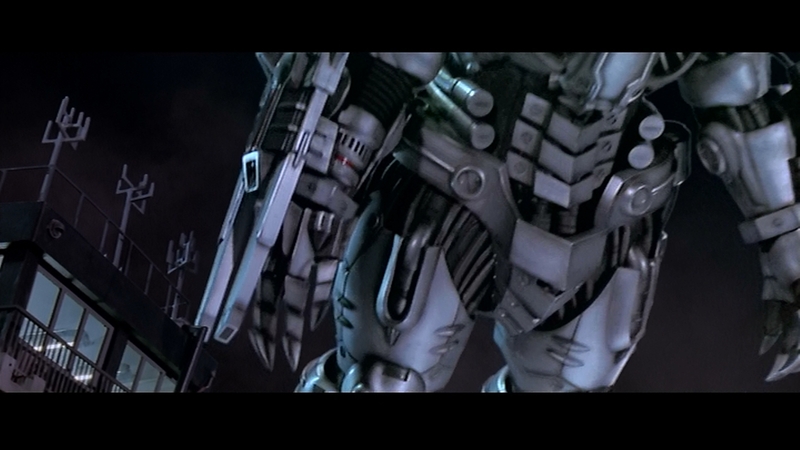 It's big, the third Mechagodzilla, and it looks pretty cool. However, how long are you interested in staring at it? Because the filmmaker, like many before him, gives us plenty of time to look at the mini-maker's handiwork. We hear the command to deploy Kiryu at 46:20. And then we begin a long series of beauty passes, intercut with people looking or saluting the awesome vehicle. 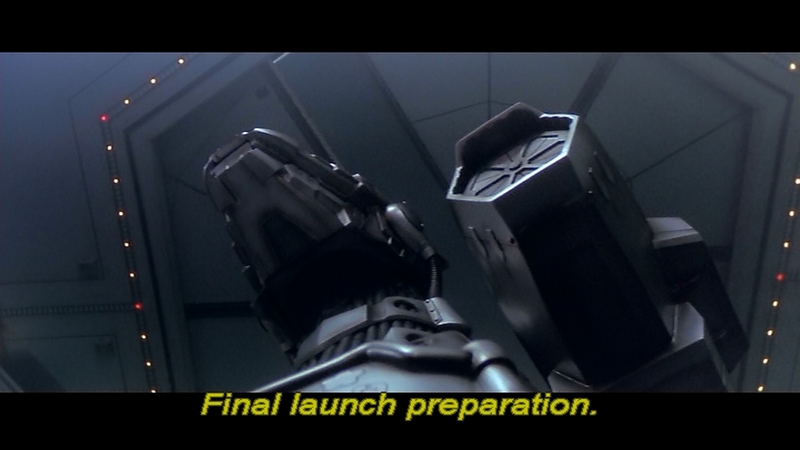 Until it finally ends at 48:50, a full two and a half minutes after we hear the order to deploy. The problem is that nothing interesting has happened. I love suitimation more than most, but the long passes don't impress me. I'm more interested in what it does. Heck, you don't even have to tell me all of it's Checkov's Guns. The giant robot is going to pour a bunch of different-colored special effects into it's opponent, and that's going to make explosions. That's what I want out of a giant robot. Imagine a two and a half minute scene, with cuts, of someone awesome standing in an elevator, saying nothing. That's excruciatingly dull. The fact that the character is huge and a robot does not make it any more interesting. I'm hoping that with the plot elements and human drama that are integral to the the giant robot deployment in Pacific Rim, it will be less excruciatingly wasted time.